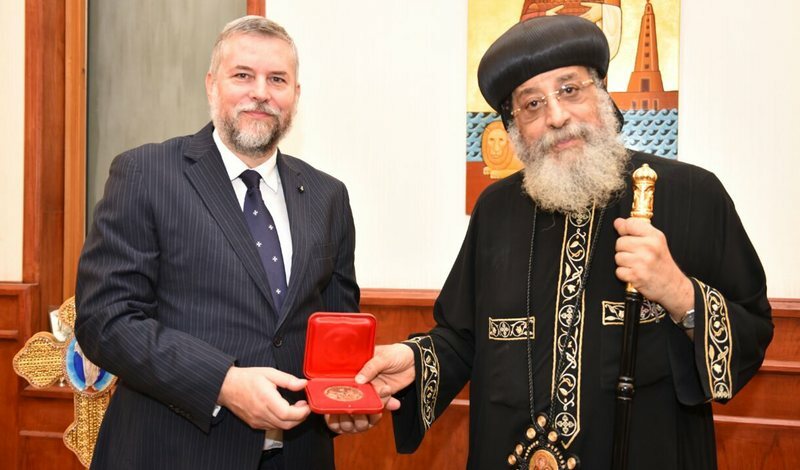 His Holiness Pope Tawadros II, spiritual leader of 20 million Copts, received in audience the Ambassador of the Sovereign Order of Malta to Egypt Mario Carotenuto, on the occasion of the Blessed Gerard holiday. During the audience, the Ambassador brought greetings from the Lieutenant of the Grand Master, Fra’ Giacomo Dalla Torre del Tempio di Sanguinetto and presented to His Holiness the humanitarian, hospitaller and social activities promoted by the Order in Egypt and around the world. Pope Tawadros expressed his feelings of vivid appreciation, encouragement and wishes.